This page is about connecting the FAST system to your computer. It roughly covers connecting the bus between the nodes. For electronic details see the FAST section in the pinballmakers.com Wiki. 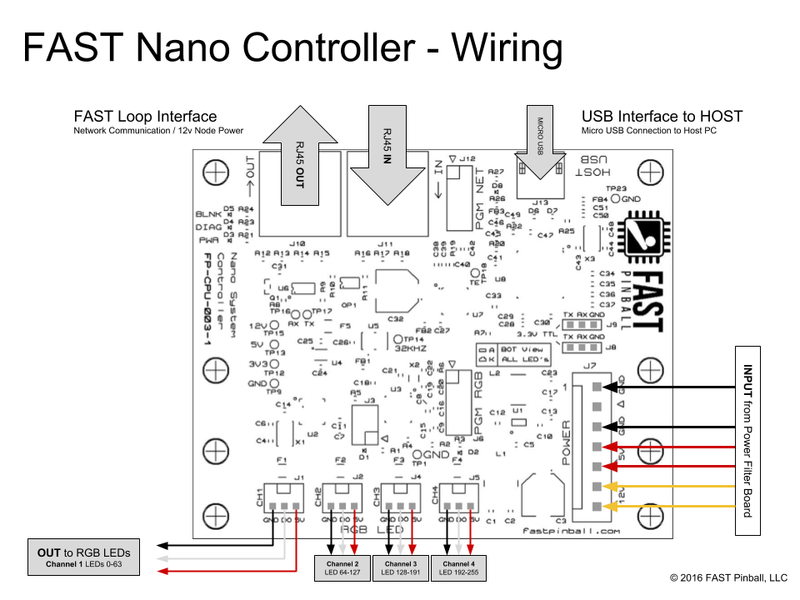 Connect your FAST NANO controller to your PC using USB. Then connect the OUT port of your NANO to the IN port of your first node board. Consequently, connect the OUT port of the first node to the IN port of your second board. Connect the OUT port of the last board back to the IN port of your NANO. The number: setting for each driver/switch is its board’s position number in the chain, then the dash, then the driver/switch number. 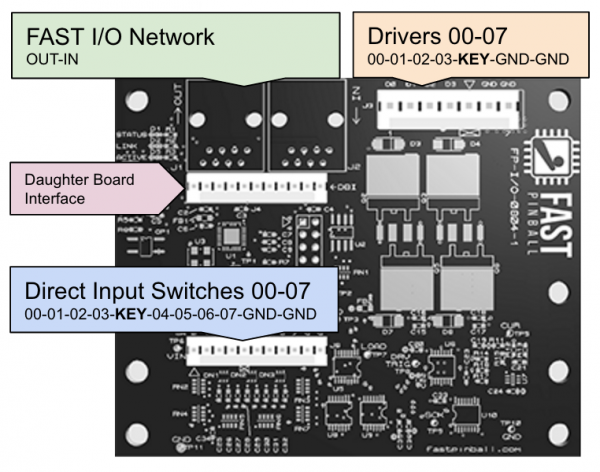 Note that the position number starts with zero, so the first IO board in the chain is 0, the second is 1, etc. If you have more than one ttyUSB device connected to your PC (e.g. the FAST Nano and a FAST DMD) you can assign a name to your ports based on the USB port they are connected to. First identify the port of your FAST hardware. Usually it should be /dev/ttyUSB0 or /dev/ttyUSB5. SUBSYSTEM=="tty", ACTION=="add", DEVPATH=="/devices/pci0000:00/0000:00:14.0/usb1/1-4/1-4:1.1/*", SYMLINK+="ttyNET", GROUP="adm", MODE="0660"
After a reboot you should get a /dev/ttyNET device if you connect a FAST device to that specific USB port. You can use that port in your config.